Crabgrass—you know it, you hate it. Or, maybe you don’t really know it at all! Many gardeners, homeowners, and lawn-lovers tend to label any undesirable grassy vegetation as “crabgrass”—grouping all weeds together under this blanketing misnomer. True crabgrass is an annual plant that produces many seeds and, after gaining a foothold in your unhealthy lawn, can re-seed itself yearly—thus producing an ongoing crop of ugly unwanted vegetation that competes with your desirable lawn grasses. Crabgrass is so named because of its spreading flat appearance on the ground—not unlike the appearance of a crab on the beach at the seashore. 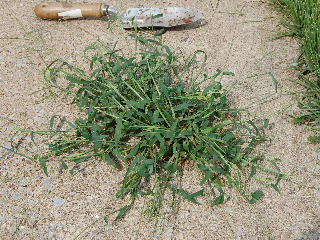 The most commonly appearing forms of the weedy grass (especially in the United States) are hairy crabgrass and smooth crabgrass, distinguished as you might imagine by the texture of the wide flat-growing leaves of the plant. 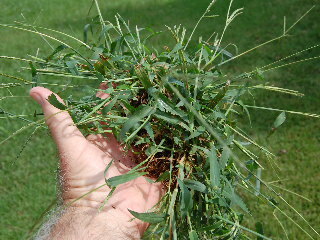 Each clump of crabgrass can spread outward reaching a size of 12 inches or more in diameter. In lawns that have a thin stand of desirable grasses in unfertile soil, the clumps of crabgrass can virtually take over. Herein lies the key to one of the best cultural practices available to control and eliminate crabgrass—establish a healthy lawn! If your soil is properly fertilized, adequately seeded, and watered sufficiently, the thick and healthy stand of desirable lawn grasses will make it virtually impossible for the crabgrass to invade and establish. If crabgrass seeds are present in your thin stand of lawn grass, the warm weather of late spring and early summer will lead to germination of the crabgrass seeds. The plants will grow throughout the heat of summer (sometimes it seems like the hotter the summer, the more crabgrass there will be!) and produce another crop of seeds that will germinate the following year—thus continuing the cycle. If you’ve had problems with crabgrass in the past and you’re now trying to smother it out by establishing a healthy lawn, you might want to add a pre-emergent to your lawn early in the year to prevent germination of the existing crabgrass seeds. If crabgrass plants still do emerge in your lawn, you can eliminate these with herbicidal applications of crabgrass killer applied either with your tank sprayer or through your hose-end sprayer. Check with your garden center for easy and safe to use products. Keep your lawn thick and healthy to keep crabgrass at bay.